The nature of hospital activity is changing in many countries, with some experiencing a broad trend towards the creation of hospitals groups or chains and multi-hospital networks. 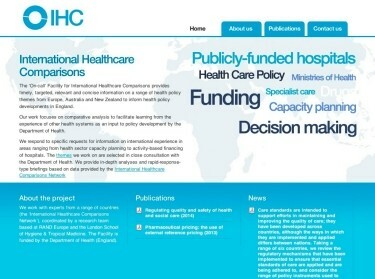 This report seeks to contribute to the understanding of experiences in other countries about the extent to which different hospital 'models' may provide lessons for hospital provision in England by means of a review of four countries: France, Germany, Ireland and the United States, with England included for comparison. We find that here has been a trend towards privatisation and the formation of hospital groups in France, Germany and the United States although it is important to understand the underlying market structure in these countries explaining the drivers for hospital consolidation. Thus, and in contrast to the NHS, in France, Germany and the United States, private hospitals contribute to the delivery of publicly funded healthcare services. There is limited evidence suggesting that different forms of hospital cooperation, such as hospital groups, networks or systems, may have different impacts on hospital performance. Available evidence suggests that hospital consolidation may lead to quality improvements as increased size allows for more costly investments and the spreading of investment risk. There is also evidence that a higher volume of certain services such as surgical procedures is associated with better quality of care. However, the association between size and efficiency is not clear-cut and there is a need to balance 'quality risk' associated with low volumes and 'access risk' associated with the closure of services at the local level. Nolte, Ellen, Emma Pitchforth, Celine Miani, and Sheena Mc Hugh, The changing hospital landscape: An exploration of international experiences. Santa Monica, CA: RAND Corporation, 2014. https://www.rand.org/pubs/research_reports/RR728.html.